Hey friends! If you’ve been following along Girl Heart Food for a little bit, you know I’m all about balance. One week I’ll share a super indulgent recipe, another maybe something more, shall I say, waist friendly. 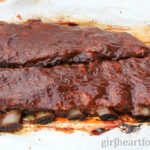 The main thing is that the recipes are easy, budget friendly and delicious! So, today I’m aiming for the healthier side of things with this vegan broccoli soup. It’s seriously jam packed with goodness, you guys. I debated on what to name this baby. 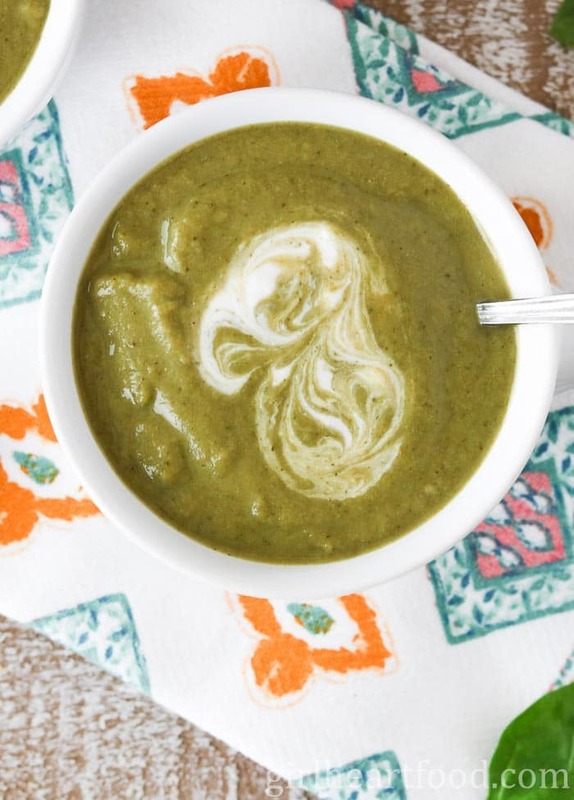 ‘Green goddess soup’ definitely crossed my mind, but I ended up going with something simple…vegan broccoli soup. Maybe the name choice is not quite as exciting as ‘green goddess’, but the taste factor is definitely there. We LOVE broccoli in our home and always have a bunch in the fridge. Hubby can eat it until it comes out of his eyeballs, lol. Aside from this veggie packed soup, we love it roasted. 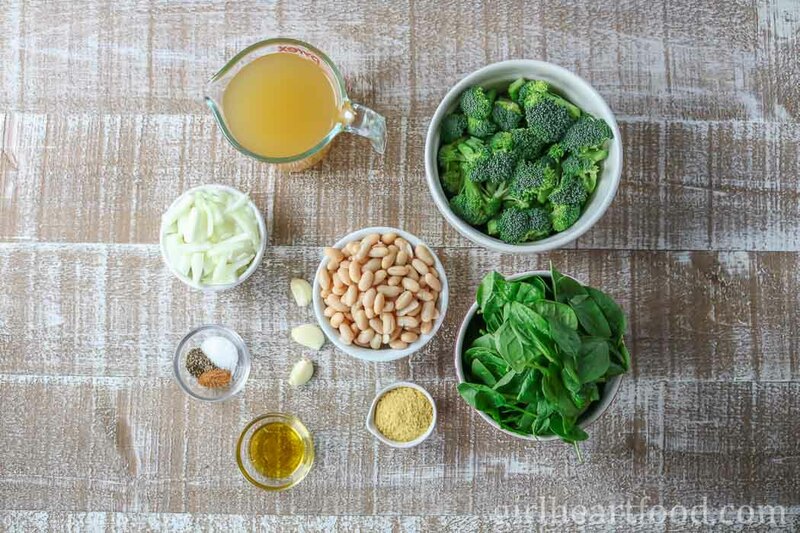 What’s your favourite way to prepare broccoli? 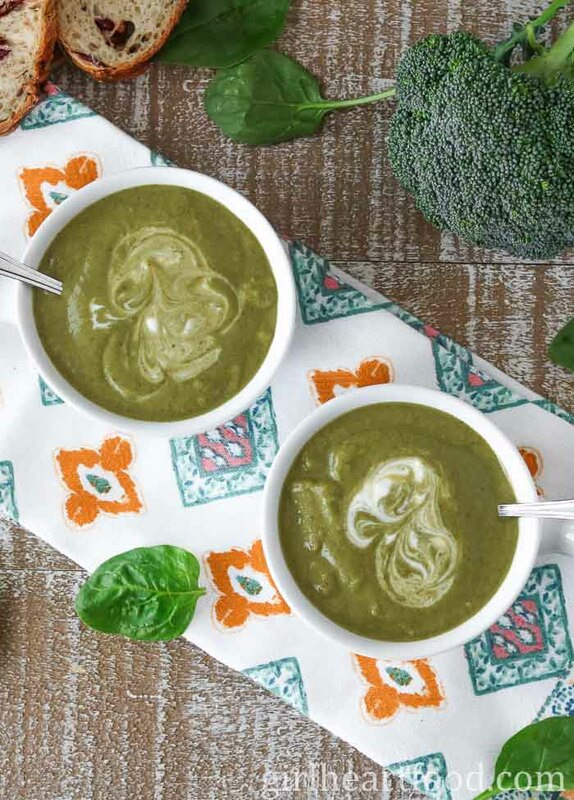 What makes this vegan broccoli soup creamy? White kidney beans! I’ve used this technique in other soups and even chili and it always works out great! Beans thickens this broccoli soup substantially so there’s no need for heavy cream. And, as an added bonus, they provide a nice hit of fibre. 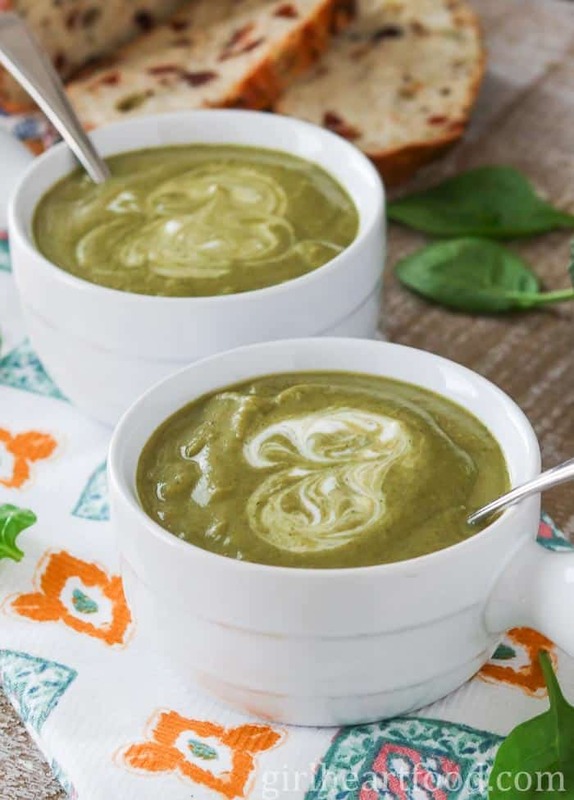 To really amp up the ‘green power’ of this soup, baby spinach comes to the party. Spinach not only contributes to the colour, but provides added fibre and vitamins. All good stuff! Can You Freeze Broccoli Soup? Yep! You can! Freeze cooled soup in vacuum seal bags, seal, lay flat on a baking sheet and place in freezer. OR place soup in freezer bags or containers. How Long Does this Vegetable Soup Last in the Fridge? I would enjoy within 3-4 days. This soup is on the thicker side. However, if you prefer to enjoy it thinner simply add more veggie stock. Nutritional yeast is used in this soup to add a subtle ‘cheese’ flavour, but you could omit if you prefer. Don’t have fresh baby spinach on hand? Try frozen. Just thaw and squeeze excess moisture before adding to soup. 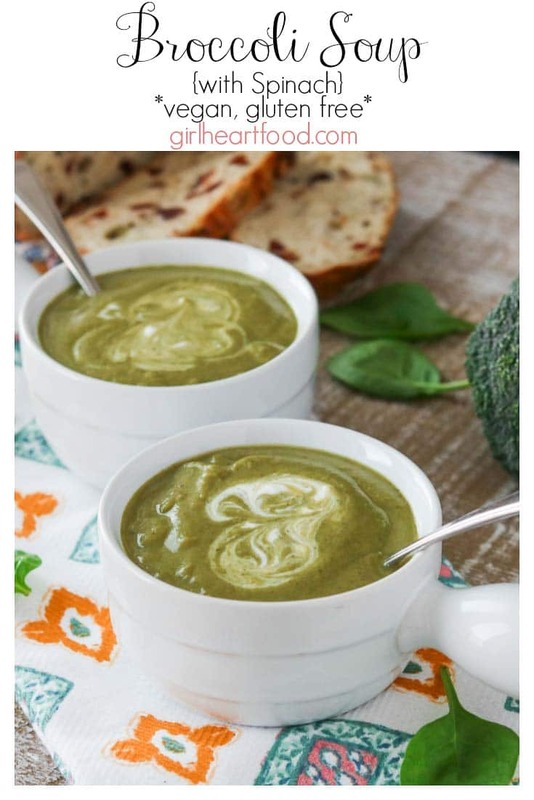 Hope you enjoy these vegan broccoli soup as much as I do! 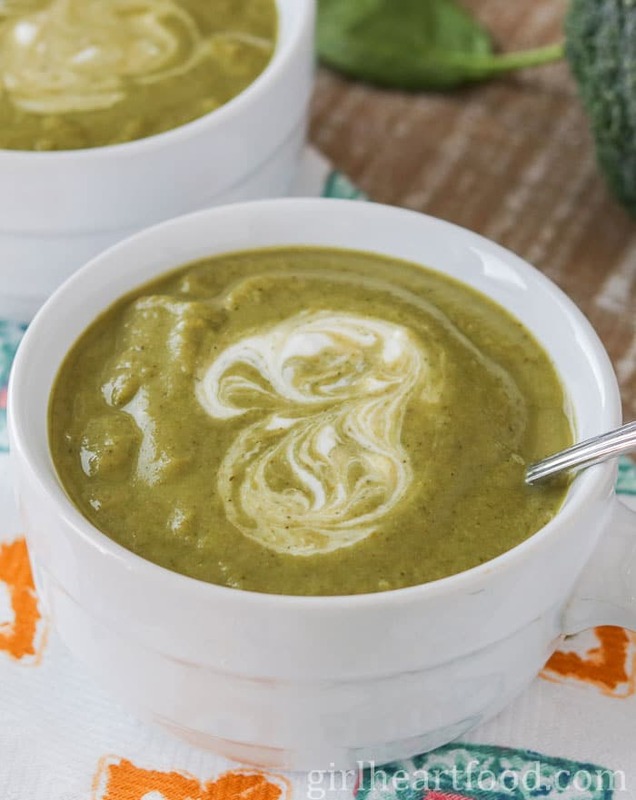 This Vegan Broccoli Soup is chocked full of broccoli and lots of good for you ingredients like spinach, and white kidney beans. Even Popeye would approve! In a dutch oven or pot on medium low heat add olive oil. Add onion to pot and cook for about 5 minutes until translucent. Stir in garlic and cook 1 minute. Stir in spinach, salt, pepper, nutmeg and nutritional yeast. Cook 2 minutes. Add broccoli, beans and stock. Bring to simmer, cover ajar and cook 10-15 minutes or until broccoli is tender. Blitz with an immersion blender until smooth. Add more broth if you want a looser consistency. If you want to garnish with shredded vegan cheese, go for it! Enjoy! Nutritional yeast is used in this soup to add a subtle 'cheese' flavour, but you could omit if you prefer. Don't have fresh baby spinach on hand? Try frozen. Just thaw and squeeze excess moisture before adding to soup.